Surround sound and 4K TVs are great for watching movies at home, but there's still nothing like sitting in front of a gigantic screen in an IMAX theater. I recently got an exclusive first look at the company's next-generation digital laser projectors, and I walked away from the experience wanting to see every single movie remastered and projected using the new technology. What the company has developed for the future will change the movie theater experience for decades: the gigantic images the company is known for are now bright and sharp enough to reveal every last detail that filmmakers and cinematographers worked hard to capture. Colors are so bright and intense that they now add even more realism to computer-generated images. And contrast is so distinct that when watching footage from the International Space Station you feel as if you're actually staring into the blackness of space. It's like the first time you have an In-N-Out Burger, and then realize you can never step foot in a McDonald's ever again. Digital projectors that rival the brightness and quality of traditional film projectors have been used in movie theaters around the world for quite a few years now. You'll be hard-pressed to find a brand new theater that doesn't have digital projectors installed in every auditorium. They're easier to maintain, simpler to calibrate, and distributing a movie on a hard drive is much cheaper than shipping a heavy set of film reels. To the general movie-going public, digital projectors produce crisper images compared to what they saw coming from prints on film. There's no more dirt and debris randomly popping up on screen, and that subtly shaking image—a result of Gate Weave as the film physically moves through the projector—is no more. But while digital projectors improved the theater-going experience for most audiences, there were still some compromises with switching to the new technology. The giant digital projectors used in movie theaters today all work basically the same way. White light from an extremely bright (and hot) xenon bulb passes through a prism, like you see in the photo above, and is split into the three primary colors. On the sides of this prism are three chips covered in thousands of individually-controlled tiny mirrors that redirect the now-separated red, green, and blue light through a lens and then onto the screen in various combinations and intensities. That's a gross over-simplification of how the process works, but that's essentially how a modern digital projector is able to produce millions of colors on screen. There are lots of subtle problems with that approach, though. As brighter and darker images are being generated, the components surrounding that prism are constantly heating and cooling. Modern projectors are designed to maintain a constant temperature for all of those parts, but it's impossible to do it perfectly when one side of each of those mirrored-chips is pressed right up against that glass prism. As a result, those components repeatedly expand and contract during the course of a movie which subtly pushes those chips in and out of alignment. And that produces visual artifacts on-screen, like a loss of clarity and sharpness. It also takes its toll on the hardware over time, slowly degrading the image quality as a projector is continuously showing movie after movie, day after day. This technology also can't reproduce the extreme level of contrast that film is able to capture, and a film projector is able to display. Which means a lot of directors and filmmakers simply aren't happy with how a movie they've spent months and months mastering ends up looking in a modern theater. Digital projectors might have many advantages over film, but there's still a tremendous amount of room to improve the technology. And that's exactly what IMAX has done. As a company, IMAX has always been about making the movie-going experience as immersive as possible for the audience. That's why it built a gigantic 120-foot wide screen in a movie theater in Sydney, and why it managed to convince filmmakers to wrangle massive cameras capturing images to giant 15-perf 70-millimeter film. Seeing an IMAX film is a completely different experience to seeing a movie in a regular theater, and to continue to improve that experience, the company realized that digital projectors needed some major upgrades. And the key to IMAX's next generation digital projection technology is lasers. Laser-based projectors aren't exactly a new thing, though. They've actually been around for quite a few years. But what sets IMAX's new projector technology apart is how those lasers are being used. That problematic prism setup? That's gone. You don't actually need a prism to split white light into the three primary colors because you can already get lasers in red, blue, and green. So what this magical box does (IMAX wasn't interested in giving away the secrets of how all of the new proprietary technology it spent millions of dollars developing worked) is redirect the light from a trio of lasers onto a screen in precise mixes and intensities to reproduce more colors than the human eye can discern. That's at the heart of what makes IMAX's new digital projectors such a leap ahead of existing technologies, but it's only a part of a larger system that's designed to produce an image with never before seen levels of detail, sharpness, contrast, and brightness. The Cineplex Scotiabank IMAX theater in downtown Toronto is the first public theater in the world to be upgraded with the company's new laser projector technology, and during my behind-the-scenes tour of the projection booth another one of the system's not-so-secret features was revealed: every theater will actually have two of these laser projectors working in tandem. It's not for redundancy, though. The two projectors actually work together to achieve absolutely stunning levels of brightness and contrast. When an image with both bright and dark areas is projected using the digital technology in place in theaters now, the brighter areas of the frame always end up washing out the details in the darker areas. With IMAX's new projection technology there's a stunning amount of detail preserved in the darker areas of an image, even if other parts of the frame appear brighter than the sun. The side-by-side dual projector setup also helps improve sharpness and reduce the jagged aliasing artifacts often seen along curved edges in digital images. On a 50-inch 4K TV it's all but impossible for your eyes to see any digital artifacts, but when a 4K image is projected on a 120-foot wide screen, they suddenly become easy to spot. And artifacts like that can distract audience members from the experience. So to help that 4K image look as clean and sharp as possible on a giant screen, as part of the IMAX mastering process two nearly identical images are produced that are projected on top of each other at the same time. But while those two images look identical, they're actually not. They're both slightly shifted, imperceptibly, to produce extra in-between details at the sub-pixel level when overlaid on top of each other. People often refer to film as having an unlimited resolution because there are no individual pixels to quantify. And that was one of IMAX's goals with its new projector technology. At a technical level each projector is producing a 4K image, but working together they help produce an image that's nearly impossible for the human eye to discern the individual pixels. On top of all that, IMAX's quality control systems means that the theater experience a movie-goer in Sydney has, will be exactly the same experience as someone in Toronto has. Sensors in the actual projectors keep track of everything from temperature to humidity, and all of that data is monitored remotely from IMAX's HQ. So if an individual component in one of the projectors reports an abnormally high spike in temperature, the company will know that a failure could be imminent and will dispatch a technician to replace the part before it actually fails. There are also cameras constantly pointed at the screen to monitor image quality and ensure the system is always properly calibrated for optimal visuals. And in addition to the vast improvements made to what's seen on-screen, IMAX is also introducing an upgraded 12-channel surround sound system with additional side and ceiling speakers that will be constantly monitored by microphones placed around the space to ensure that the company's incredibly powerful sound system is working properly. IMAX has always focused on providing a movie-going experience like no other, and this new projection system and the technologies behind it allows the company to take things one step further. And not only with a better image on screen, but with the ability to ensure that every single IMAX theater in the world is working exactly as they've been designed to. I can remember the first time I saw a movie in a theater with a brand new digital projector. While the rock-steady image was bright, crisp, and extremely colorful, I walked away being impressed with the new setup, but ultimately wanting more. And the demo that IMAX gave me of its new laser projector delivered exactly the 'more' I had been looking for many years ago. IMAX believes that the brightness and contrast levels from its new laser projection system will outperform even traditional film projectors. And having seen both regular and IMAX films over the past 15 years in the very same theater I saw these demos, the difference is night and day. Brightness is a big issue in a theater with a screen that can be as large as 120-feet wide, and IMAX claims its new laser projectors are about 60 percent brighter than its previous-generation xenon-bulb based technology. But a brighter image is only half the equation. TV makers like to boast about the obscene contrast ratios achieved by their latest models, but even the most expensive flat-screen TV you can buy for your home theater can't even begin to compare with what IMAX has managed to achieve with its new projector system. As immersive as seeing Christopher Nolan's Interstellar in IMAX was last year, seeing the film remastered for these new laser projectors is an entirely different experience. You see details that were simply washed out by the old projector technology, and combined with the crispness and brightness of the image it's probably as close as you'll ever get to seeing what an astronaut sees while they're in orbit. IMAX has even gone so far as to upgrade the lighting in its theaters, redirecting bulbs away from the screen to help maximize and coax every last bit of contrast from its new projectors. It's unfortunate that the recent rise and fall of artificially adding depth to almost every single 2D blockbuster has turned audiences off of 3D movies. Because IMAX has been doing 3D properly for decades now, and its new laser projector technology promises to vastly improve that experience as well. When a projector is tasked with displaying twice as many images as it was designed to—a different frame for the left and right eye—there's a significant drop in overall brightness. And the movie-going experience simply isn't as magical when the screen is dark and colors are muted. During the demo IMAX showed me the trailer for How to Train Your Dragon 2, first a 2K version in a normal-sized theater with a standard xenon digital projector, and then a version remastered for its new laser projectors in its larger theater. The difference in brightness was reason alone to give 3D a second chance, but what really stood out from that demo was the intensity of the colors—specifically in a dark scene in a cave full of fire-breathing dragons. Not only was I able to see details in the dark areas that were all but invisible in the other theater, but suddenly the fire in the dragons' mouths looked more real and intense. It had more layers, more nuances, and though it was just a CG simulation, it made the fire appear far more believable. It's almost impossible to convey the difference in words, you really need to experience it with your own eyes, but it's like wiping the layer of dust that's accumulated on the screen your grandparent's old CRT TV, and suddenly seeing the bright colorful picture hidden beneath. Over the years movie theaters have used endless gimmicks to help fill seats, but that's not what IMAX is about. It's not a gimmick, but a genuinely better and more engaging way to watch movies. And this new technology, which is all but invisible to audiences, simply serves to make the IMAX experience even more mesmerizing. 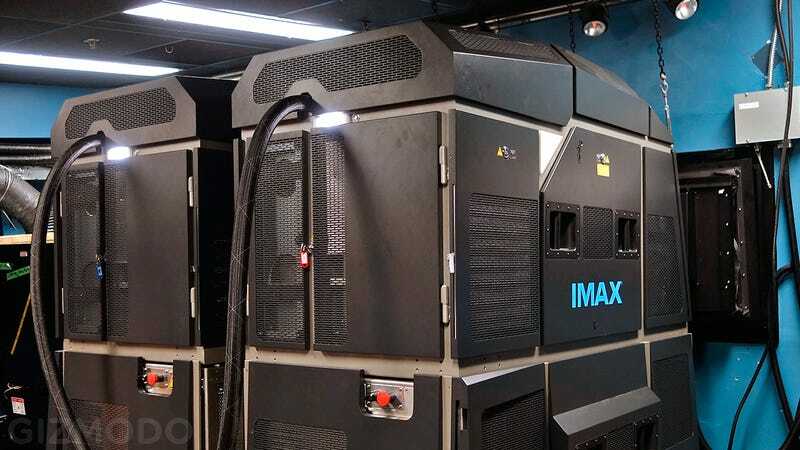 Once all of IMAX's theaters around the world have been upgraded with its new laser projection technology, the question will no longer be, "should we see this movie in IMAX?" The question will be, "why would you even want to see a film if there isn't an IMAX version available?"